ab34445 recognises alpha 1 integrin subunit. Human Integrin alpha 1 subunit. Our Abpromise guarantee covers the use of ab34445 in the following tested applications. Integrin alpha-1/beta-1 is a receptor for laminin and collagen. It recognizes the proline-hydroxylated sequence G-F-P-G-E-R in collagen. 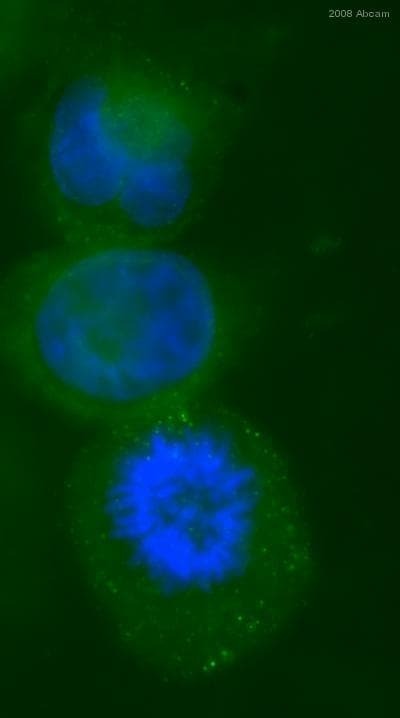 Staining of HeLa cells with MOUSE ANTI HUMAN CD49a (ab34445). Publishing research using ab34445? Please let us know so that we can cite the reference in this datasheet.